A 46 TZ Special Max Operating Speed - 80 m/s Max RPM - 8,500 rpm Suitable Applications: Stain.. Cutting Disc A 24 Extra Max Operating Speed - 80 m/s Max RPM - 8,500 rpm..
A 60 TZ Special Max Operating Speed - 80 m/s Max RPM - 6,600 rpm Applications: Stainless Steel.. Cutting Disc A 24 Extra Max Operating Speed - 80 m/s Max RPM - 6,600 rpm..
Klingspor Stone Curtting Disc C 24 R Supra Max Operating Speed - 80m/s. Max RPM - 6,600 rpm Appli.. 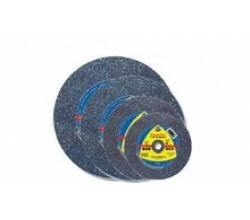 Cutting Disc A 30 N Special Max Operating Speed - 80 m/s Max RPM - 5,100 rpm For use on Bench Cut.. Cutting Disc A 24 R Special Max Operating Speed - 80 m/s Max RPM - 5,100 rpm..
Klingspor Stone Curtting Disc C 24 Extra Max Operating Speed - 80m/s. Max RPM - 5100 rpm Applicat.. Cutting Disc A 30 N Special Max Operating Speed - 80 m/s Max RPM - 4,400 rpm For use on Bench Cut..
Klingspor Cutting Disc A 24 R Special Max Operating Speed - 80 m/s Max RPM - 4,400 rpm..